BRUSSELS, Belgium, September 18, 2014 (ENS) – Over 2,000 European towns and cities are participating in the 13th annual European Mobility Week, a week-long series of events from September 16-22 coordinated by a consortium backed by the European Commission. The aim of this year’s European Mobility Week, with the slogan “Our streets, our choice,” is to encourage citizens to “reclaim” urban spaces to create the city they want to live in, organizers say. Towns and cities that plan a full week of events, introduce permanent measures and set up a car-free day can apply for the European Mobility Week Award. If selected, municipalities join the ranks of previous award winners Ljubljana, Slovenia; Zagreb, Croatia; Bologna, Italy; and Gävle, Sweden. During European Mobility Week, citizens in more than 2000 cities in 43 countries are participating in sustainable commuting challenges, teleworking campaigns, flash mobs, car free day events, creative competitions and festivals. In Valencia, Spain, residents are reclaiming Compas Centre as a car-free public space for sustainable mobility. When the Valencia city walls were demolished in 1865, the area became a shared space for bicycles, public transport and pedestrians moving between the city center and outlying districts. But recently the area was transformed into a ring road for motor vehicles. The aim of this action is to revert this inner ring road back to a car-free public space for sustainable mobility, first for a single day, and eventually permanently. Across Austria cities and towns are holding “Blooming Streets” painting competitions. Children have the chance to reclaim their streets by painting streets the way they would like to shape them. This initiative is organized through schools and with the best effort earning a prize. One of the highlights of this year’s European Mobility Week in Aarhus, Denmark will be a small caravan called the “Rolling Mobility Lab” as part of the smart mobility project. Wherever the caravan appears, citizens will have the chance to co-create new measures such as making cycle lanes safe and attractive enough to change residents’ travel behavior. To support an increase of cycling’s modal share in European cities, elected representatives, technical staff and mobility experts from many European countries will meet at the Supporting Cycling for Liveable Cities conference in Venice, Italy on October 1. European local authorities are invited to sign up to the European Mobility Week Charter and publish their programs on www.mobilityweek.eu. This year, the EU is launching the 2014 Sustainable Urban Mobility Plan (SUMP) award within the framework of the “Do the Right Mix” campaign. In its third edition, the award recognizes outstanding work being carried out by cities and local authorities across Europe to meet the transport needs of their communities in an effective and sustainable way. The winning region or local authority will receive a prize of €10, 000 and international recognition for its initiatives. Applications are being accepted between September 16 and November 3 on the Do the Right Mix website, where details on eligibility and evaluation criteria can also be found. In 2013, the SUMP award went to the city of Rivas Vaciamadrid, Spain. European Mobility Week began in 1998 with the French “In Town Without My Car!” day. This initiative still runs in September each year to encourage towns and cities to close streets to motorised vehicles for a day. This allows people to see a different side to their towns and cities, encouraging the use of sustainable modes of transport and raising awareness of the environmental impacts of the choice of transport mode. The success of this French initiative led to the launch of European Mobility Week in 2002. 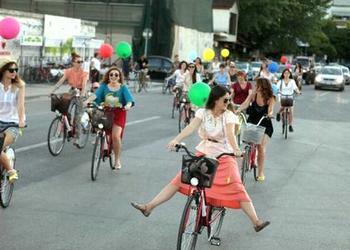 Since then, the impact of European Mobility Week has grown across Europe and around the world. In 2013, 1.931 cities representing 176 million citizens registered for the campaign. A total of 8.623 permanent measures have been implemented, mainly focusing on infrastructure for cycling and walking, traffic calming, improving transport accessibility and raising awareness about sustainable travel behavior. The European Commission supports European Mobility Week with around €300,000 a year, which funds Europe-wide coordination and the Mobility Week Award. The cities that take part have to find their own funding; they cooperate with public authorities, civil society groups and other partners.